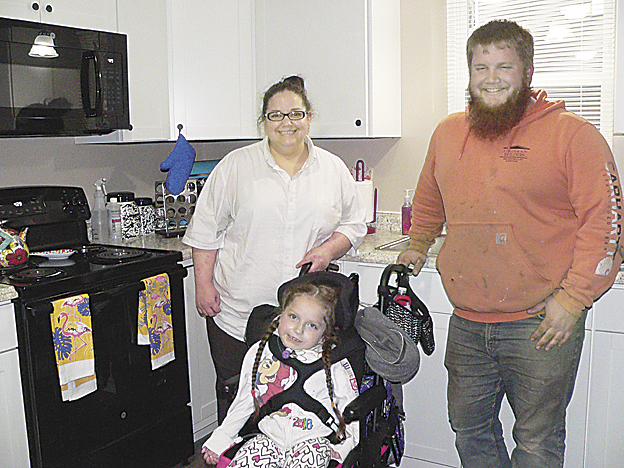 Michelle Grassmyer stands with her daughter Arizona and their landlord Tyler Smith, in the kitchen of their newly and specially renovated Milroy home. The Grassmyers have been looking for a handicapped accessible residence for over a year, so Smith renovated the bottom half of a split-level home to accommodate their needs. 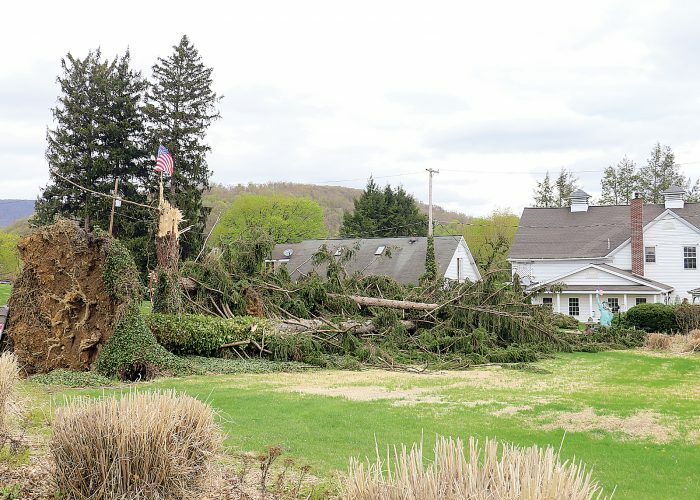 MILROY — Imagine the home you have fits the size of your family but does not meet your family’s needs, especially because one of your family members is wheelchair-bound. Until about a week ago, that was the Grassmyer family story. Five-year-old Arizona Grassmyer woke up one day, 11 days before she turned 1 year old, unable to move anything from her shoulders down. Her mother, Michelle, said, eventually, Arizona would be diagnosed with Transverse myelitis, a neurological disorder and inflammation of both sides of one section of the spinal cord, which interrupts the messages that the spinal cord nerves send throughout the body, according to www.mayoclinic.org. Just months before Arizona fell ill, Michelle had moved herself, her daughter and two sons from Alabama to Lewistown, to be closer to her family. When they moved in, the house with a second-story bathroom and narrow steps was amenable, but for the last four years it became harder and harder to tend to Arizona’s needs. Michelle had to use a utility cart and baby tub to bathe Arizona downstairs, barely able to squeeze the equipment in between doorways. As Arizona grew, the issues grew with her, so they started searching for a manageable residence. The closest they came to finding what they needed were a few homes with first-floor bathrooms, but all of them were too small for Arizona’s chair. 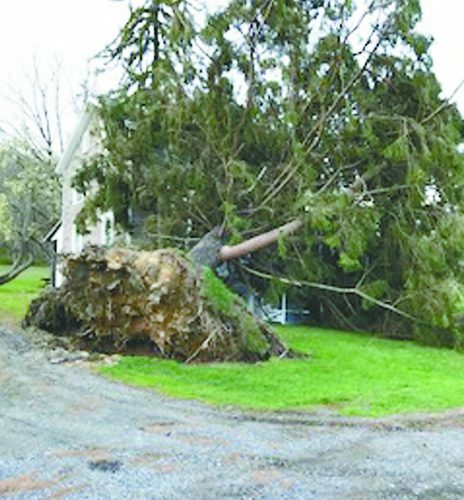 Then, Michelle said, their Bayada Pediatrics Case Manager, Britney Hall, remembered a friend of hers had a son who had recently purchased a property which he planned to fix up: Tyler Smith. Smith said the hardest part was making all the rooms spacious enough to accommodate the wheelchair, but over the past four months he went to work, widening the doorways, putting in a ramp to the back entrance and installing the handicapped accessible shower and sink, all the while keeping the Grassmyers up to date on the progress. Now, Arizona enjoys being wheeled around her new home by one of two nurses, or being in her favorite room of the house: the kitchen. “I like the kitchen because I like to watch mommy cook,” Arizona said. Arizona also likes watching Spongebob SquarePants and playing with her hamster, Hammy, when she’s inside, or going outside to watch the horse and buggies go by. Michelle said she likes that the house is all one floor because Arizona likes playing with seven-year-old Makyn or 14-year-old J.D. As far as Michelle is concerned, their new place is the just home they need.